Because there are many protein supplement options, it can be difficult to work out which type of protein is best for long-term health. There’s a definite trend towards plant-based protein supplements and while these can have their own benefits, we thought it would be good to take a closer look at whey protein and why it should be a part of a healthy eating program. It’s no secret that we pride ourselves in providing some of the highest-quality undenatured whey protein, which means that most of these natural proteins are delivered to you intact. Let’s start with glutamine. It’s one of the most abundant amino acids in the body and is required as a source of fuel for white blood cells and for any cell that has rapid duplication (such as epithelial cells that line the intestinal tract). It has been shown to have a role in digestive health, immune health and boosting energy levels (3). Leucine is another key amino acid. It is one of the branched chain amino acids and is responsible for driving a process called ‘Muscle Protein Synthesis’ (MPS) which basically means the growth of new muscle. Research has shown, that with and without exercise, a diet rich in leucine results in higher levels of lean body mass (muscle) and lower levels of body fat (4). Whey protein has also been shown to support healthy immune function by providing adequate nutrients (like the amino acid cysteine) to generate an important antioxidant, called glutathione. Glutathione is found in all cells, and particularly concentrated in white blood cells. Healthy glutathione levels are a key component of a strong immune system (5). Glutathione also plays a major role in the detoxification systems within the body. It binds to toxins such as heavy metals, solvents and pesticides, allowing for efficient excretion via the kidneys. Eating sources of whey protein is one way to help support healthy levels of glutathione in the body and help maximise natural detoxification systems (6). Whey protein has demonstrated real effects for promoting satiety, fat burning and muscle growth in scientific studies. Studies have shown consistently that higher-protein diet containing whey protein during periods of calorie restriction assists with retaining muscle during weight loss and can help lead to better regulation of appetite than carbohydrates or fat (7, 8). The concentration of branched-chain amino acids including leucine is considered to be the primary signal in stimulating muscle synthesis (9-11). There’s a big difference between ‘good’ and ‘bad’ weight loss. The good kind, the kind we should be going for, is losing the least amount of muscle in relation to body fat. Getting enough protein is one of the keys to preserving the most muscle while restricting calories but research shows protein may be lacking in a lot of weight loss diets, considering that on average the amount of weight loss most people have is about 30 percent from muscle. In a recent study at McMaster University, whey protein slowed the decline of muscle protein synthesis (MPS) as a result of weight loss and showed that the source of protein (being whey in this study) could be an important factor in preserving muscle in long-term weight loss (12). 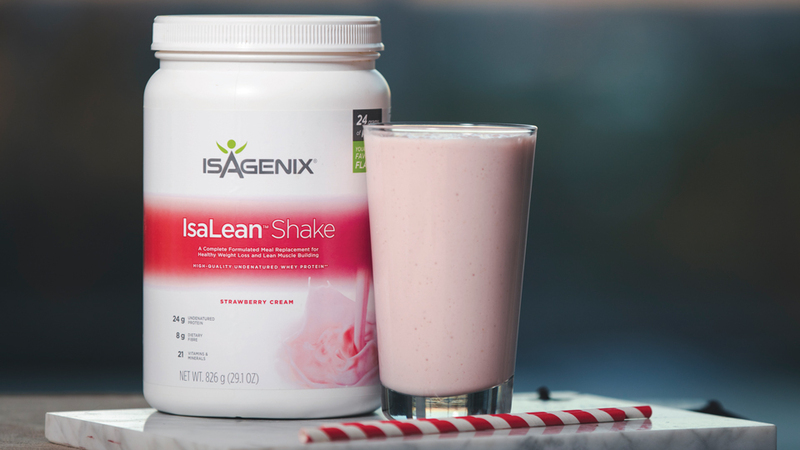 This finding was also repeated when our Isagenix® System (which included two IsaLean™ shakes per day) was validated in the Skidmore College study, which showed that lean body mass (muscle) actually increased while body fat continued to decrease (13). Aaaaand… if we do say so ourselves… our IsaLean Shake tastes pretty good! Available in Creamy Dutch Chocolate, Creamy French Vanilla, Strawberry Cream, Chocolate Mint and yummy seasonal flavours, they are creamy, delicious smoothies that deliver 24 g of the highest quality undenatured protein in the most convenient, economic package. And if you are looking for a little more protein, we’ve got you covered with our IsaLean™ PRO alternative, that delivers 36 g of that same quality whey protein in Natural Chocolate, French Vanilla or Strawberry Cream. Whether you choose IsaLean Shake or IsaLean PRO, you are getting a balanced blend of carbohydrates, good fats, vitamins and minerals, along with all the benefits of whey protein. So, raise your smoothies and say cheers to your best health! Gorrisen SHM, Witard OC. Characterising the muscle anabolic potential of dairy, meat and plant-based protein sources in older adults. Proceedings of the Nutrition Society (2018), 77, 20–31. Newsholme P, et al. Glutamine metabolism by lymphocytes, macrophages, and neutrophils: its importance in health and disease. J Nutr Biochem 1999: Vol 10: 6; 316-324. Biolo G, Tipton KD, Klein S, Wolfe RR. An abundant supply of amino acids enhances the metabolic effect of exercise on muscle protein. Am J Physiol 1997; 273: E122–9. Sekhar R et al. Deficient synthesis of glutathione underlies oxidative stress in aging can be corrected by dietary cysteine and glycine supplementation. Am J Clni Nutr 2011; 1-7. Layman DK. Dietary Guidelines should reflect new understandings about adult protein needs. Nutr Metab 2009; 6:12. Acheson KJ, Blondel-Lubrano A, Oguey-Araymon S et al. Protein choices targeting thermogenesis and metabolism. Am J Clin Nutr 2011; 93:525-34. Tang JE, Moore DR, Kujbida GW, Tarnopolsky MA, Phillips SM. Ingestion of whey hydrolysate, casein, or soy protein isolate: effects on mixed muscle protein synthesis at rest and following resistance exercise in young men. J Appl Physiol 2009; 107:987-92. Phillips SM, Tang JE, Moore DR. The role of milk- and soy-based protein in support of muscle protein synthesis and muscle protein accretion in young and elderly persons. J Am Coll Nutr 2009; 28:343-54. Hulmi JJ, Lockwood CM, Stout JR. Effect of protein/essential amino acids and resistance training on skeletal muscle hypertrophy: A case for whey protein. Nutr Metab 2010; 7:51. Arciero PJ, et al. Protein-Pacing Caloric-Restriction Enhances Body Composition Similarly in Obese Men and Women during Weight Loss and Sustains Efficacy during Long-Term Weight Maintenance. Nutrients 2016, 8(8), 476.